The results of a year-long study of 160 farmers with access to cheap irrigation from solar-powered pump-sets in Bihar revealed that despite a poor monsoon, all the farmers grew paddy in their land during the Kharif season (monsoon) in 2013. More importantly, farmers with access to cheaper irrigation from solar pumps could water their crops more frequently managed to save money on irrigation, reaped higher yields of both paddy and wheat, and were able to plant rice in 90% of their land in a drought year. The findings by the International Food Policy Research Institute in its 2014 report not only ended up endorsing the virtues of solar energy but also came as a shot in the arm for Delhi-based start-up Claro Energy, whose solar-powered pump sets were the ones that the farmers had used. Only 35% farms in the country are suitably irrigated; few have a power connection and dependency on diesel pumps is immense.Though potential for ground water irrigation is very high in Bihar, eastern Uttar Pradesh, Bengal, and the Godavari and Krishna plains, these geographies still have the lowest tubewell density. But now, these very states are proving to be a fertile hunting ground for Claro. Set up in 2010 by Kartik Wahi, Gaurav Kumar, and Soumitra Mishra, Claro initially started off as a renewable energy company but, eventually, found its holy grail in solar energy. “Like most undergrads we harboured the ambition of starting an enterprise but never discussed it with each other during engineering,” laughs Wahi who had co-founder Kumar as his batchmate at Bharti Vidyapeeth Engineering College, Pune. Mishra, the third co-founder met Wahi during his MBA at Kellogg School of Management, Illinois and by the end of their term, Wahi and Mishra started toying with the idea of doing something on their own. “Cleantech was big in the US. We landed in California to explore something in waste management. A three-week trip to California expanded to three months and we set up a company there. We tried to work as an advisory firm,” reveals Wahi. It was in 2010 when the National Solar Mission was launched in India. “I thought we were probably sitting on a goldmine and we decided to go back to India to gauge the ground situation,” says Wahi. In January 2011, Kumar, too, gave in his papers and joined the duo. Pooling in Rs.13 lakh each, the trio set the ball rolling with Claro Energy. Initially, Wahi focused on wind and Kumar on solar. The latter who hails from Bihar, started working in his home state focusing on solar rooftops. “We did the typical start-up mistakes initially. We didn’t have a clear focus, and spread ourselves thin. In the first 10 months, we didn’t cover any ground,” reveals Wahi. However, Kumar’s effort in Bihar yielded fruit soon. “The only place we found traction was Bihar. I was told, if you can run pumps, there is latent demand for irrigation. 20% of power goes into irrigation. And not many companies were focusing on the state,” mentions Kumar. The next logical step for the founders was to speak to Indian business houses and advise them on foraying into solar pumps. “But they were unwilling to pay for advice,” quips Wahi. Thus, the trio themselves decided to focus on solar pumps, where they were seeing some traction. The big break came when a Bihar government official challenged them to demonstrate something with defunct pumps. “He said they had defunct tube well pumps in the range of 7.5HP to 15HP and will give us two weeks and a site,” recalls Wahi. The initial set of defunct tube wells were located across 20 villages in five blocks of the Nalanda district and were equipped with 7.5HP submersible pumps with a capacity to discharge 70,000 litres per hour. The challenge faced, Mishra says was that “most large pumps are AC pumps while power supply in rural India is in single phase DC.” Also in some villages where electric tube wells were working, power was available only for four to five hours a day. There was no fixed schedule; farmers kept waiting and had to irrigate fields at night on many occasions. They made headway after the start-up engaged with a couple of power companies to demonstrate that conventional pumps can be solar powered. “We finally managed to run a 7.5HP pump. It was the largest solar pump in the country at that time and we managed to gain publicity,” says Wahi. 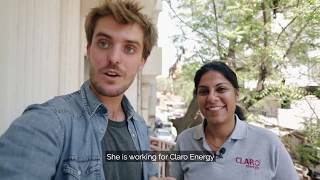 Claro managed to make the pumps solar-ready by adding three components – solar modules of 8.5 kW capacity, variable frequency controller and remote monitoring systems – to the existing tube wells. In fact, when the Bihar government floated a tender, they were the only solar-pump focused company, to bag the contract. Conventionally, farmers have been using diesel. While diesel is not a clean fuel, it is long-term economics that works in favour of solar pumps. Mishra says, “While in an urban setting, diesel power costs Rs.14/15 a unit, it goes up to Rs.20/22 a unit on a rural farm owing to inefficiencies. On the other hand, power from an off-grid solar panel costs Rs.8/10 a unit.”The operating cost is also negligible as solar panels have a 20-year life span. However, a solar pump’s average payback period is five years given that a 3HP pump costs Rs.4 lakh, which includes installation and maintenance charges. In comparison, a diesel pump can be installed for Rs.25,000 with a recurring cost of Rs.60 a litre. This meant that solar pumps had to depend on government subsidy ranging between 60% and 80% of the overall cost. “Pumps are mostly sold under state government’s tender schemes,” says Mishra. But the challenge of dealing with subsidies was something that Claro had not clearly envisaged. In one particular project, a farmer had to pay 20%, the Centre 35% and the state 45%. It so happened that while the state paid the subsidy quickly, the Centre took some time. Then there were some programmes where the states moved diesel subsidy to solar and in some the subsidy component of 40% had to come through banks. Though their business model wasn’t capex heavy since Claro bought equipment only on getting a confirmed order, the erratic cash flows meant managing working capital was a pain. “The banks were conservative. They needed collateral and weren’t keen on securitising cash flows. We realised the need to tweak our business model to address the working capital requirement,” reveals Mishra. Following the government’s focus on solar, quite a few players such as Premier Solar, Shakti Pumps, Gautam Pumps had entered the solar pump business but found the last mile implementation a challenge. For Claro, nearly 40-50% of its revenue came from services such as installation, maintenance and servicing. “We realised that we were the end-user touch point and could leverage our capability,” says Wahi. So, instead of only relying on tenders, Claro also become an end-to-end implementing agency for other players. “Today, we have 2,500 plus installations and close to 3,000 installations, worth Rs.70 crore, under implementation,” mentions Wahi. A chunk of its order-book is from three states: 1,000 pumps in Maharashtra, 800 in Bihar and 300 in AP and Telangana. While 95% of the order-book is its own, the balance comprises third-party contracts. For instance, in Bihar, there are other players who are supplying the pumps as well. “They had bid and got the contract along with us, but are now asking us to execute the contract for them,” mentions Wahi. In a bid to grow its business, Claro is testing waters with a pay-per-use irrigation service through portable solar pumps. Farmers will call a toll-free line or click an app to order the service and pre-pay, allowing them to irrigate their farm without upfront capital investment. A trolley with a pump owned by Claro is hooked on to a rented tractor. The rent costs Rs.120 to Rs.180 per hour. Currently, five pilot projects are on at Gopalganj in Bihar. Based on the initial results, Claro expects to recover its investment in portable solar pumps in four years, based on a monthly revenue of around Rs.5,000/Rs.6,000. “We have finalised criteria for this project. There have to be 30-40 farmers who own two acres of land each, and are focusing both on fruit and vegetables as they are not just high-yielding crops but also need more water. Third, we want to engage with women farmers who are more loyal and diligent customers,” reveals Wahi. The co-founders are toying with the idea of appointing franchisees for the rental service. “The franchisee will deposit the money and will have access to our metering and pre-paid technology,” adds Kartik. Claro has scaled up in a very short span of time and its turnover has jumped from Rs.3 crore in FY12 to Rs.28 crore in FY16. At a macro level, agriculture consumes a staggering 132 billion units or 20% of all the power generated in the country. Even if a fraction of that can be powered by solar means there is huge scope for Claro to grow. But it’s the intangible that the co-founders of Claro are happy about. “We have noticed many farmers don’t need to wake up too early in the morning to water fields as they now have assured water supply,” points out Kumar. That, indeed, makes for a sunny disposition.